Mr. Tracy Wright is the Director of Bands at Ringgold High School. His bands include the Wind Ensemble, the Symphonic Band, the Jazz Bands, the pit orchestra for the musicals presented by our musical theatre, and the Ringgold Marching Tiger Band. He has been at the high school for 3 years now and has had many successes with his bands at their marching competitions, large group performance evaluations, and their many concerts throughout the year. Before he came to the high school, he was the Director of Bands at Ringgold Middle School, where he also had many successes with the Beginning Band and the 7th and 8th grade band. Recently, Mr. Wright was awarded the Legion of Honor award from the John Philip Sousa Foundation. This award makes him a Legion of Honor Laureate, which means he is a person honored for outstanding achievement in creative or intellectual fields. The Foundation’s chairman found Mr. Wright through a video of the Ringgold High School Band and their performance at the world-famous Carnegie Hall in New York City. The chairman had heard the band’s music and nominated Mr. Wright for the Legion of Honor in September 2018. 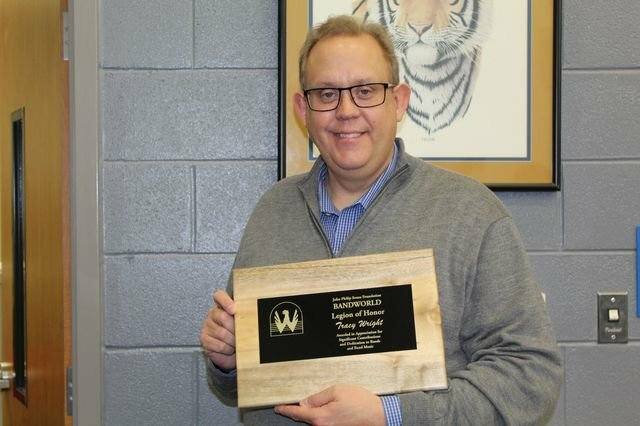 To be chosen for this award, Mr. Wright had to receive six letters of recommendation from prominent band directors or former directors from all over the country. The band directors who were willing to help him on his journey to becoming a Laureate included the band director at the University of Purdue, the band director at Texas A&M, a retired middle school band director from Virginia named Jim Meredith, Robert W. Smith, a famous music composer, David Holsinger, another famous music composer, and Alfred Watkins from Lassiter High School. Mr. Wright says that most of the success for this award came from the motivation of his students, stating, “The band made a commitment not only musically, but financially as well,” referring to the trip to Carnegie Hall in April 2018. He admires his students for their dedication to the band, as well as their dedication to each other to perform together and create beautiful works of art. He believes that this award will bring a positive impact on his career, including more chances for the Ringgold Band to travel around the country or even the world. This will also give opportunities for students to bring their high-level performances to other famous concert halls, music conventions, and college honor bands. The hard work of the students has given Mr. Wright opportunities to go perform with groups around the world, including a performance he has in France for the 75th anniversary of D-Day this upcoming June. He hopes that this award will bring a bright future to his career and hopes that his students will continue to grow under his teachings.